can trap be used in reptile cage? It could be, but fruit flies generally are the result of rotting fruit. If you are using fruit as a food, then using a trap will not provide better attraction than the fruit. Traps only work in the absence of food or an attraction. The other question is, are they fruit flies or gnats? 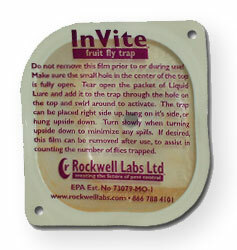 Fruit Fly traps will not attract or capture gnats. The best trap may be the Catchmaster Gold Stick. It works great for gnats.